Who cares to admit complete defeat? Practically no one, of course. Every natural instinct cries out against the idea of personal powerlessness. It is truly awful to admit that, glass in hand, we have warped our minds into such an obsession for destructive drinking that only an act of Providence can remove it from us. But upon entering A.A. we soon take quite another view of this absolute humiliation. We perceive that only through utter defeat are we able to take our first steps toward liberation and strength. Our admissions of personal powerlessness finally turn out to be firm bedrock upon which happy and purposeful lives may be built. People in the Twelve-Step programs know that until you’re hurting enough, the Steps won’t work for you. But for the fortunate sufferer, there comes a time when he or she says, “I’ve got to get well. I can’t stand living like this anymore.” And that is when one is ready for the miracles of the Twelve Steps. It is not easy to admit powerlessness. All of us want to maintain the illusion that we can manage our lives on our own. Eventually, however, we must all face the fact that there is a gap between our intentions and our ability to carry them out. This gap shows up in different ways for each of us. We may intend to stop drinking, but find that we are unable to do so for more than short periods of time. We may want to stop turning to food every time we feel sad or anxious, but find ourselves eating far beyond what we intended. We may want to be more expressive of our deepest feelings, but find ourselves emotionally withdrawn. We may promise ourselves that we will spend more time with our children, but continue to allow work to take priority. All of these gaps between our intentions and our actions are evidence of powerlessness. We attempt to bridge the gap between our intentions and our behavior by trying harder to do things differently. But trying harder doesn’t always work. In fact, sometimes the harder we try, the more unmanageable our lives become. Twelve Step programs begin with the admission that we cannot make the changes we need to make by using willpower alone. Whether we believe we are addicted or not, the lie that we are smart enough or competent enough or powerful enough to manage our lives on our own will eventually be shown for what it is–an attempt to play God. It takes courage to face our powerlessness. But the admission of powerlessness makes possible a dramatic spiritual change in our lives. The first word of Step One implies that healing takes place in community–not in isolation. This is not a new idea. 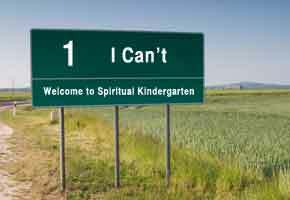 Spiritual kindergarten begins with the admission that we are in trouble. When we acknowledge this, we are ready to begin our spiritual journey toward peace and serenity. Admitting the truth is not something we can do casually. For most of us it represents a major change in business-as-usual. We have learned pretense, evasion, and denial. Now we must learn to admit the truth. The Bible puts a high value on telling the truth: “Each of you must put off falsehood and speak truthfully to his neighbor” (Ephesians 4:25). The falsehood that we “put off” in Step One is the belief that we do not need any help–that we can handle it, that we are managing our lives successfully on our own. In Step One we admit that this is not true. To our surprise, when we admit this truth, new and better ways of living become possible for us. Being powerless does not mean that we are incompetent or helpless–or that we have no power at all. It means that we cannot rely on our will alone to achieve wholeness and peace. Willpower alone is not powerful enough. We see our powerlessness when we try to solve a problem through willpower (by determination, commitment, and trying harder) but find that the changes we achieve are only temporary. We may try to control the drinking or drug use of someone we love, but trying, trying harder, and trying our hardest will not make us powerful enough to achieve our objective. Or we may promise not to say yes to additional responsibilities, only to find ourselves taking on more and more obligations. If you have made promises, decisions, or choices and then found that your determination and commitment were not powerful enough to achieve the desired results, then you know what it is to experience powerlessness. If you have experienced fear or anxiety that you are unable to manage, you know what it is to be powerless. If you hide behind defenses of one kind or another and cannot be at ease with yourself or others, you know what it is to be powerless. The Apostle Paul talked about powerlessness when he said, “I have the desire to do what is good, but I cannot carry it out” (Romans 7:18). Paul realized that the solution to his problem would need to involve more than just increased willpower. The central point of powerlessness is that willpower alone is not sufficient to enable us to make permanent changes. Trying harder didn’t work for the Apostle Paul, and it doesn’t work for us either. The word “alcohol” in Step One can be replaced with other substances, behaviors, or conditions. Narcotics Anonymous, for example, replaces “alcohol” with “our addiction.” Some codependency groups replace it with “other people’s choices.” Some Christians use the word “sin” or “the effects of sin.” The use of other words to replace “alcohol” allows anyone to use the Twelve Steps. The basic principles of the Steps are the same no matter what substance or behavior may be the focus of our addictive process. What does it mean that our lives are unmanageable? It means that our efforts to manage our lives are not successful. We keep doing the things we think will solve our problems, only to find that our solutions are often worse than our problems ever were. There is an old slogan in A.A. that summarizes this: “I never had a problem that was worse than the old solution I found for it.” Our lives become unmanageable because our “solutions” make things worse. We may eat because we don’t want to feel so depressed, but the reality is that compulsive eating makes us more depressed. We may act out sexually because we don’t want to feel so lonely, only to find ourselves more alienated than ever. We may run up large debts by buying new clothes so that we will feel less shame, only to feel the added shame that our spending is out of control. Solutions like these do not satisfy us for extended periods of time. The problems always return in one form or another. The prophet Isaiah was on target when he asked, “Why spend money on what is not bread, and your labor on what does not satisfy?” (Isaiah 55:2). Step One invites us to face the fact that our efforts to manage our lives have not worked. We will not be able to find better solutions until we have seen with clarity that our current solutions are part of the problem.